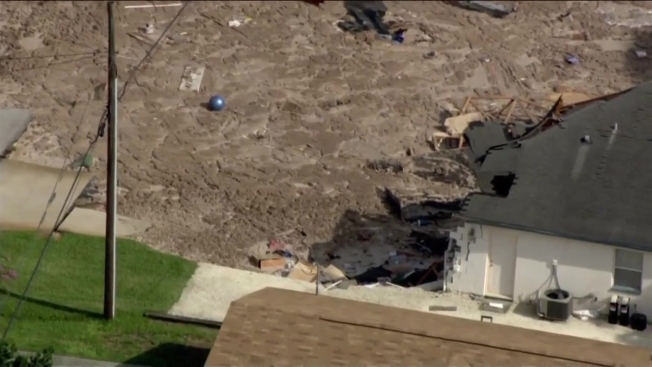 A sinkhole that started out the size of a small swimming pool and continued to grow in Florida swallowed a boat, destroyed two homes and prompted officials to evacuate residents from about a dozen homes Friday. Dramatic video showed the home in Land O' Lakes, north of Tampa in Pasco County, collapsing into the hole Friday morning. It quickly engulfed one home and a boat and then consumed about 80 percent of another home, said Kevin Guthrie, Pasco County's assistant county administrator for public safety. By Friday afternoon, the hole stretched up to 250 feet wide and 50 feet deep, and threatened to damage a third home, Guthrie said. Pasco County Fire Chief Shawn Whited told reporters that no one was home when crews responded to a call about a "depression" under a boat in the backyard of a house in Lake Padgett Estates in Land O'Lakes. Within minutes, he said, "the hole opened up" and the boat fell in. Firefighters were able to get two dogs out of the home and retrieve some belongings before the first home started collapsing into the quickly expanding hole. "This is people's lives. They have everything in that house. The house that I went into, the elderly woman was in a walker, so we wanted to make sure we got medications — things that she needed," Deputy Jay Murphy said. Sheriff Chris Nocco said that within roughly 30 feet of the sinkhole, the ground was soft underfoot and felt like it was moving. "Walking down the street, you can see in people's eyes the anxiety level. They're fearful," Nocco said. The sinkhole had been dormant for about 90 minutes Friday night when Nocco addressed members of the media, but officials were cautious because it's the rainy season. A fence was being erected around the sinkhole. The scene is being considered a hazardous materials incident because of possible septic tank issues and building debris. "We're all wondering what's going to happen next. We can't control this. This is mother nature," said the sheriff, who added that plenty of rescue crews were on standby to evacuate residents quickly, if necessary. Eleven homes were evacuated, including the two destroyed. County property records show there was a sinkhole at the property where the first house was swallowed up, and that it had been stabilized in 2014. The home was sold in 2015, according to records. Messages left for its owner were not immediately returned Friday. Sinkholes are stabilized by boring holes into the ground and injecting concrete. Records also show a sinkhole was stabilized at the partially destroyed home in 2007. Two sisters renting that home with four other family members said they had left the house early Friday and returned to see their neighbor's home falling into the sinkhole. The Tampa Bay Times reported that Edilia and Theresa Villa and their relatives had time to retrieve important documents and six dogs from their house before officials declared it unsafe. Theresa Villa's 15-year-old daughter, Thalia Chapman, told the newspaper the family moved into the home after arriving from Cuba about a decade ago. Officials say Duke Energy cut power to about 100 homes in the neighborhood. The American Red Cross is assisting residents who've been displaced. Guthrie said he was concerned that if the sinkhole continued to grow, it would damage septic tanks that could pollute a nearby lake.